A value proposition is really important for first time visitors to see. This is especially true when your company is a pureplay without a high street presence as is the case with Made. The company brings designer furniture at lower costs by cutting out the middle men and producing furniture in batches, which is then shipped straight to consumer. Factors such as longer wait for delivery are ones that Made has to convey to the consumer in order to manage expectations. Of course, this message is a positive one, because it’s all about value. 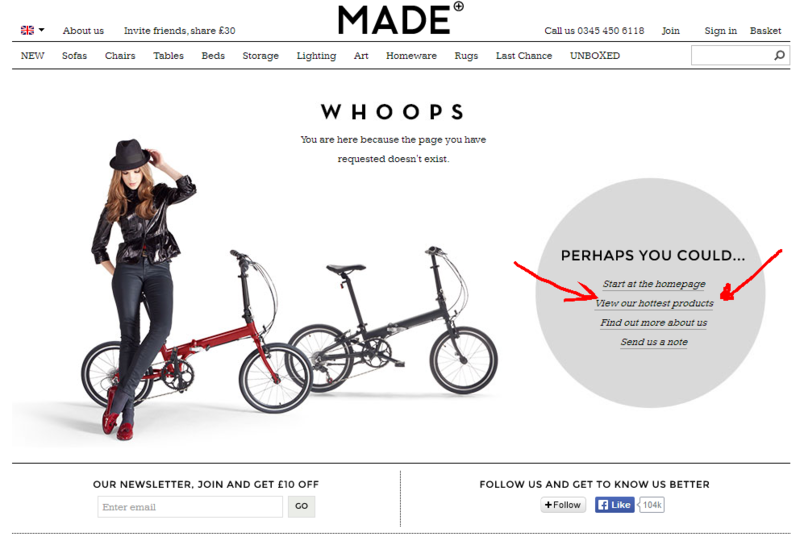 Made gets it across in an animation that is partly interactive and drops down when you click on ‘How Made.com works’. I think it’s an effective bit of web design. It’s subtly done, but look! Amanda from Chorleywood is buying from Made.com right now, so why can’t I? The design of Made.com is contiguous with the design of the products it sells and the design of the ideal homes of its customers. What I mean by that is the website ‘fits’ the products perfectly. There’s a minimalism and clarity to the site that is also sought in the furniture and homeware on sale. Before I sound too up my own backside, here are a couple of screenshots to demonstrate. Each product page has a call-to-action under the header ‘real inspiration’ that asks users to ‘send us your snaps’ and featured images will get £15. This is a pretty epic commitment to user generated content. It shows that Made understands that as a pureplay it needs to work hard to create engagement that might normally be sought on the high street. Regarding the pieces as ‘real’, even though users’ orders are yet to be produced, is vital for consumers to engage with the site and browse as in a store. Seeing photos from customers’ homes also helps to show the quality of each piece, not just the stock images on site. Unboxed is a social network for Made customers, where peers can answer questions about products and post pictures of their own. This is obviously going to be popular, as people who are proud of their homes want to brag about it to others. Positioning a user community in this way is quite innovative – the emphasis is on imagery (see the Pinterest-style design) and inspiration, as opposed to merely product feedback or FAQs. The messaging when one first visits the Unboxed website is, in my opinion, spot on. There’s great imagery as usual, but the copywriting stands out. It makes clear that Made might be a pureplay, but it’s about real people, real furniture and spaces. Click through to take a look at the site. Lots of companies offer referral fees if existing customers persuade friends to get on board. However, what’s particularly nice about Made is the way it displays the offer. The number of friends a consumer refers is equated with a piece of furniture that the reward could buy. This is very compelling and again adds a visual element to the page. Additionally, both the referrer and their friend receive a discount, which is a neat way of getting both parties on board. Made tries to reassure the user at every turn that they are getting good quality. There’s no doubt that buying to order, paying say £500 for a sofa without seeing it first, might be an act of faith for some. For the less easily convinced, the product page zoom is effective and very sharp. One can move the zoom box around the product image in window, as you can see below. It really helps to get an idea of the finish and feels like one is looking over the goods with a magnifying glass. Take a look at any of the statement furniture on Made.com, typically the sofas and chairs. The main product images are very smartly taken quite close up and from a low angle. It’s only a small touch, but it gives the products a grandiosity that cannot be ignored. There’s one shown above, but here’s another for good measure. One would think this is a widely used technique, but look at the picture below it of an IKEA sofa, no angle, no shadow, no grandiosity, less impulse to buy. 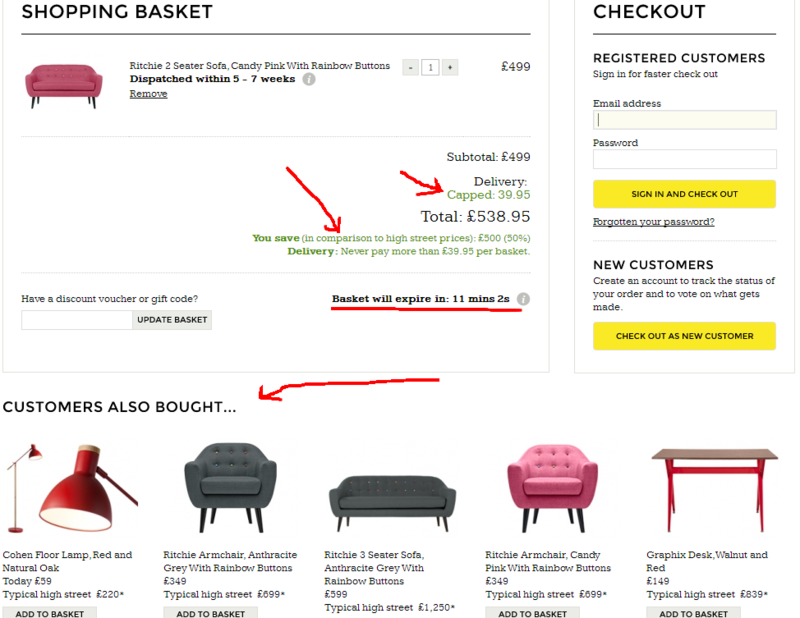 Made furniture is… made, so the countdown timers are already implicit with the service. The products are made in batches which the timers count down to. But including this timer in the call-to-action to buy, as well as including the typical high street price (with a slash) is a very persuasive touch indeed. At the bottom of product pages, mostly on the more expensive items such as sofas, there are recommended products to match with this item. This copy is smart because the recommendation is framed as style advice, quite a different beast to cross sell. There’s also a ‘recently viewed’ products display at the bottom of product pages, again with nice thumbnails. Think not about the price, but about the savings! The delivery price is announced as ‘capped’, too, which is language designed to side with the customer. There’s also a timer announcing when the basket will expire. This isn’t usually good practice, but as these products are made in limited runs, it’s necessary for Made to do this at some point. Turning it into a persuasive design point is again neat. And look at the bottom of the screen, I’m not just offered related products on the product page, but in the basket itself. My details are saved, there’s that timer again, there are securepay badges to reassure me, the high street prices and delivery details are emphasised once again and I’m guided through the checkout with a nice little roll-up functionality. There could probably be an easier way of going back one step (I did this using my browser back button), but apart from that I liked the design. This video’s a little grainy, so you’ll have to take my word for it (I need to buy a mac or get some better PC screencast tech). Again, Made makes use of limited availability by allowing the consumer to browse all the products about to be batch produced. £10 is a not insubstantial amount of money, but it’s a price Made is willing to pay (off the bottom line on a purchase) to get consumers to subscribe to the email list. Email is an incredibly important channel for the company so this is a wise tactic. Browsing through product lists, one sees a little tab with a star on it on the left hand side of the browser. Hovering over this star pops out the £10 off promotion and clicking brings up the lightbox shown below. Subscribe for £10 off your first order. Articles and features from the press are archived on the site, going back to 2010. They can be clicked on and pop out as light boxes. While not everything is legible (these are smallish images of A4 magazines) it’s still obvious as to what the style of the features are and, most importantly, which prestigious titles Made has featured in. This is another example of the pureplay reassuring the customer who thinks of herself as a connoisseur but wants to be sure the service and the end product is good. I’ve highlighted just two product descriptions below, but for two very different products, showing how much time Made has put into tailoring its copy. Both descriptions read as though written by a stylist or designer who knows the product but also how it might fit within an interior. The Kubrick sofa uses a variety of copywriting techniques, extolling the heritage of the design, gently trying to cross-sell, discussing comfort and style and also mentioning the showrooms for those who want a closer look (there are two that can be visited in the UK). Each descriptive paragraph is neatly accompanied by one of the nice product images that is also viewable on the product page carousel. You can click through either screenshot below to see the product pages on the website, where you’ll find full product specifications, too. Materials, dimensions and delivery and returns are made crystal clear. Again seeking to avoid misunderstanding or ambiguity, the product image carousel includes a scaling aid which shows the dimensions of the sofa and juxtaposes it with the outline of a person. You can also see this below. More of the same in this product description of an art print. Click through to check out the page. Monsoon has launched Swoon, a shoppable monthly magazine for tablets (but also working well on desktop). It’s full of products and rich content and was built by Rockabox Studios on the Ceros design platform. With the prices of Monsoon apparel comparable with Cos – middle to upper high street pricing – and the more artisan pieces pricier still, at more than £300, this feels like a good move. The image of Monsoon has perhaps slipped in recent years and lost some of its chic or urbanity. I can see this campaign of shoppable magazines as a step towards bringing this firmly back to the brand, which needs to highlight the quality of its clothing, including its hand-embellished pieces. The launch of a shoppable magazine is in line with many other brands seeking to bring more editorial and clustering to their offerings. Net-A-Porter has launched a mag, M&S has mixed up its website with plenty of content and trailblazers ASOS and TopShop have been doing this for a while. Let’s take a more detailed look at Swoon.